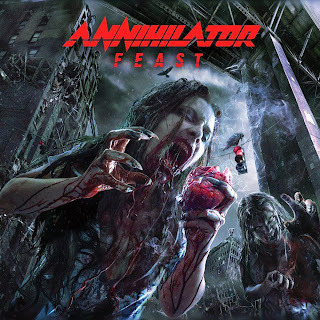 Hall of the Mountain King: Review: Annihilator, "Feast"
There may be no more underrated musician in thrash than Annihilator guitarist/founder/bandleader Jeff Waters. Of course, Waters himself may hold some of the blame for that. The band’s debut album Alice in Hell is one of the finest examples of the genre that you’ll find, and the follow-up Never, Neverland, featuring Omen vocalist Coburn Pharr, is almost as good. After that, though, things become spotty for the band. There’s some great music to be found in the rest of their catalog, but a revolving door of musicians and some occasionally bad ideas — like the programmed electronic drums on 1997′s Remains — diluted the power of those first couple of records and allowed Annihilator to slip out of the minds of many fans outside their native Canada. A reunion of the Alice in Hell lineup — minus bassist Wayne Darley, who was having health issues — brought a brief resurgence in the late 1990s, but the musical chairs soon continued. Waters, though, finally seems to have found a bit of stability again with vocalist David Padden, who joined in 2003, and the pair have released a string of very good records. The latest, Feast, might be the best since that 1999 reunion. The album starts exactly where fans expect, with a high-velocity guitar riff with that signature Jeff Waters sound on “Deadlock” as Padden snarls about society’s ills. Second track “No Way Out” takes me back a few years. The song would not have been at all out of place on Alice in Hell, and I can almost hear a Randy Rampage snarl in Padden’s verse vocal. The chorus has a bit of a latter-day Metallica feel to it, and about halfway through it takes another turn with more of a grooving riff and a more melodic vocal from Padden. “Smear Campaign” slows things down just a little with a sound from the later era of the band, but it, of course, gets cranked up into a raging thrasher before the end. That’s when Waters gives us the first left turn on “No Surrender.” He gets things started by slapping out a bass groove and dropping a little funk rock guitar over it. Padden’s vocal on the song is almost unrecognizable. Then the metal hits on a pounding pre-chorus. Eventually, the song rolls over to a more typical Annihilator piece. There’s a dark interlude and more thrash before the funk rock of the beginning returns to close it out. “Wrapped” is an old-fashioned hard rocker that’s a bit unlike anything that I can recall from Annihilator before. On first listen, I thought it sounded a lot like fellow Canadian Danko Jones, one of the top purveyors of hard rock north of the border. Perusing the liner notes, I discovered there was a good reason for that. Jones co-wrote the song with Waters, and it’s one of the more fun tunes on the record. The lone weak spot on the record arrives with “Perfect Angel Eyes,” a fully acoustic ballad. Waters has done some incredible acoustic work over the years. You need look no further than the opening instrumental from Alice in Hell, “Crystal Ann,” or even the dark opening of “Fight the World” from later on this record. But his ballads just don’t really work for me. I’ll admit that it could be because I want pure speed and aggression from Annihilator, but I don’t think that’s all of it. The album closes with three straight tracks that are more in line with the band’s catalog. Waters takes a vocal turn on “Demon Code,” and the opening of “Fight the World” is one of the best pieces of music on the record. There are a few nice atmospheric touches on “One Falls, Two Rise,” which ends the album on a very strong note. The second disc of the set, titled Re-Kill, features re-recordings of songs from throughout the band’s career. I’m usually not a fan of re-records, particularly of songs that I’ve listened to and grown attached to over the years. I have the same problem with many of the songs here. Take “Alison Hell,” for example. I like some of the flourishes and some of the depth that Waters adds to the tune, but I just can’t get into the song with Padden’s vocals. I’m too used to hearing Rampage’s. Same with “Welcome to Your Death.” Padden doesn’t hit those little screeches of Rampage. Padden fares better on the Pharr songs. “Fun Palace” and “Never, Neverland” work for him as his vocals are somewhat similar to Pharr’s. And one of the best performances for Padden comes on “Stonewall.” His vocal brings a little more depth to the song, and I think I even like it better than the Pharr. I actually also like this version of “Set the World on Fire” a little better, but I was never a huge fan of Aaron Randall’s vocals. I really would have liked to hear Padden take a shot at “Knight Jumps Queen,” one of my favorite tracks from the album with Randall. In all, the 15 re-recordings are well done, if perhaps unnecessary. Waters brings enough new elements to make them interesting while not tinkering too much with the original melodies. I also have to give them props for the packaging of the CD. I’ve always been a fan of physical product and packaging, and its getting less and less interesting in the digital age. The two CDs are contained in a hardcover book-like binding with the liner notes and a nice holographic cover. It’s one of those packages that I love having on my CD shelf. The new music, of course, is what this record is all about to fans, and the material on the first disc is some of the best that Waters has churned out in years. The rest is just icing on the cake.